It’s a bit strange to think about reviewing this new series like I would a traditional comic book, because the aesthetic is so strikingly different than any other books out there. Yes, they’re going for it whole hog here; the entire thing is presented in an 8/16 bit art style (complete with pixelization!) . 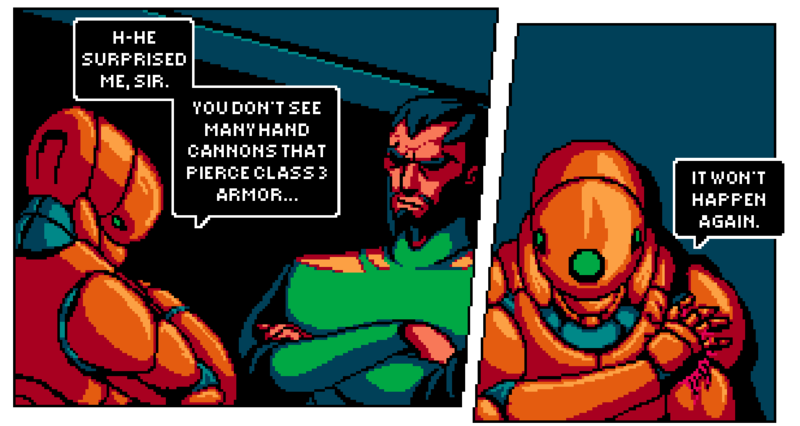 I felt as though I was watching a really epic cut-scene on my SNES the entire time I read through Nova Phase’s first two issues. This isn’t to disparage the work, because once you get used to the (initially jarring) drawing style and can focus on the whole thing, you realize it’s an extraordinary piece of graphic storytelling, independent of any aesthetic styles it chooses to adhere to. Sure, it’s a space opera involving bounty hunters – and while it initially seems like a series of well worn tropes being checked off a list, it quickly manages to reutilize those tropes quite well. The characters come off as interesting and, ironically, more than simple two-dimensional clichés. Our main protagonist is a young woman by the name of Veronica Darkwater. 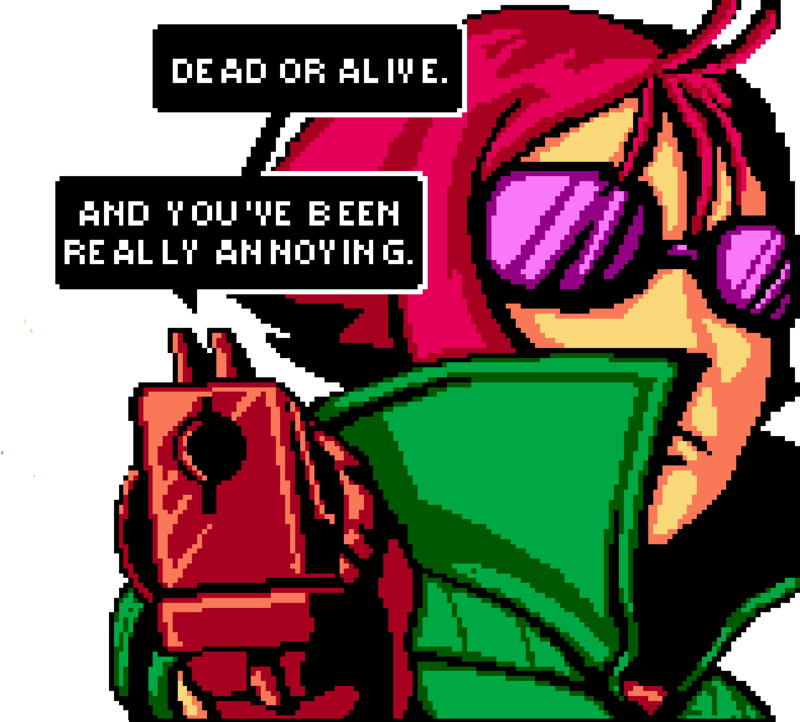 She wears a Vash coat, Ed’s goggles and has a propensity for drink and non-lethal weapons. At the start of our story Veronica makes it clear that she has one ambition in her life: to get up into space. To leave behind the sordid planet she’s on and have some goddamned adventures millions of miles away. Does she get her wish? Well, let’s just say… be careful what you wish for. We’re also presented with a suitably menacing and mysterious antagonist, a crew of space cowboys and some genuinely intriguing world-building right off the bat. The second issue is anchored by a convincing action sequence which seems to prove that the art style is very capable and that readers will not be losing anything over a more traditional pencils approach. It all flows very well and action, as well as subtlety, is conveyed quite clearly and convincingly. All in all I was very pleasantly surprised by my time with Nova Phase; it managed to get its hooks in me and what started off seeming kind of rote and familiar morphed into something I was invested in – by the time I finished the second issue I would have immediately picked up the third if I’d been able to. Matthew Ritter is the writer behind the book and Adam Elbatimy covers art duties – both these gents rise to the occasion and do their respective disciplines proud. 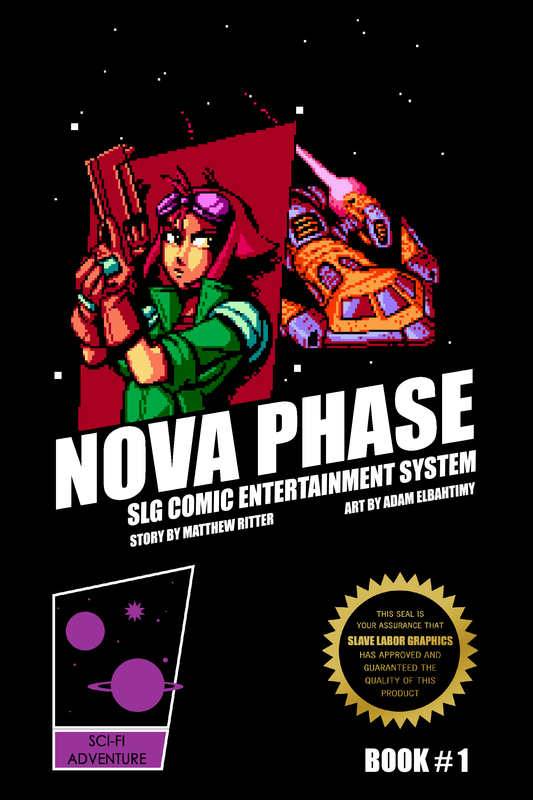 Nova Phase is being published by the always awesome Slave Labor Graphics imprint. I’m told the first issue will be available for FREE on ComiXology starting January 15th, that same day the second issue will also be available for purchase at .99 cents. GO BUY IT. Print versions will be available through the Slave Labor Graphics website (and Amazon) starting in February. See you later, space cowboys.